This page is web list of artists make an entry in Mouseion. You will link to individual gallery of every artist. In Mouseion’s art galleries, we plan to carry comprehensively many artworks, of course important works, created by a lot of artists in the world, regardless of the nationality, according to the way suitable for each artist. Every artist, specially has rare opportunity for publishing own works, let you have a bravery to apply for this request. In our site, we are planning to invite exhibiting works of some artist in Mouseion's ART GALLERIES at any time. Any artist who wishes to be listed for exhibition can do it. Even one work can be listed to exhibit, but if you have a round number of works, it is more advantageous that you can have a good opportunity for showing them to many people and make your gallery rich on account of fullness of works. However in case that your works are not suitable for exhibition with consideration of our site, we will reject exhibiting your works. As for this case, detailed information is put up in the corner of "PROTOCOL", so please read it. Fee of listing is free now. However, since we consider it might be charged some day, you, promising artist, should not miss this present best chance. Then our site deals with not only exhibition of works but also their bargain. We might select and sell works willingly by ourselves in addition to replying order from buyer. You are cordially invited to application for sale. Since, in the corner of "FAQ", question, which a lot of people sent to our site, about listing process is written, please refer it. Your question is accepted from the corner of "CONTACT", too. Please feel free to use it. He had been pursuing present realism with prominent drawing technique on the basis of his own philosophy for a lifelong time. His drawing objects are multiple including person, sea, town people, woods and other scenery. Any kind of pictures can be exhibited for the purpose of displaying to the public equally and fairly in Mouseion, regardless of the race, the nationality, the religion, the creed and the social or economical status of the painter. This is never denied by law, administrative order, religious or cultural norm and any other custom of all countries on the earth. However, following works exemplified in exception are excluded from this rule. 1. The works drawn for the purpose of instigating or encouraging genocide or suppression to the specific race, religion or some human group. 2. The works drawn for the purpose of instigating suppression by majority to the race or the religion belongs to minority in a specific area. 3. The works drawn for the purpose of only stimulating a sexual gusto through a model of picture, in case of being contrary to intention of the concerned model, or he/she is placed in the circumstance of not being able to express free intention, or he/she is recognized to lack ability to consent under the law of his /her nationality. 4. The works drawn for the purpose of only instigating pure violence to a specific individual who has no political, economic or social authority or power for revenging on him/her, or for the purpose of only insulting him/her personally. 1, In case of actual application of above-mentioned exclusion standard to a specific work, concrete contents of the standard should be displayed clearly in every refusal case of exhibition. All of concrete cases of refusal should be opened to the public on the specific site. Doubtful works which may fall under above-mentioned exclusion standard should be carried on a special closed site. This publication-limited site should be shown to only persons who are recognized to have technical knowledge about the exclusion standard in question. 2, In case someone reports that a specific work carried on Mouseion falls under above-mentioned refusal case of exhibition with his/her name revealed to the public and moreover showing a concrete reason, Mouseion will take proper steps to disseminate the fact. 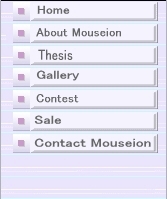 Q: On the occasion of wishing to list my work in Mouseion, how do I send it? A: First, send an image (usually photograph) of your work attached with E-mail to our site. Or if you have a web page displaying your work, send E-mail in which its URL is entered to our site. We will check your work whether it meets the standard put up in the corner of "Protocol" of our site or not. Incidentally this check has no concern with estimation of contents of works and values of author. If your work meets it, we will send you E-mail in which the process of listing is written again. Please follow its direction. Q: How many images of my works can I send? A: Please limit the number of images less than three. Make their images with JPG form. Each size of image must be less than 640 x 480 (or 480x 640) pixels, and each volume of image must be less than 60KB (61,440 byte) as well. He had been pursuing present realism with prominent drawing technique on the basis of his own philosophy for a lifelong time. His drawing objects are multiple including person, sea, town people, woods and other scenery.